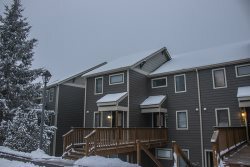 OPEN AND AIRY, SPACIOUS, FULL KITCHEN, AIR CONDITIONING, HEATED PARKING GARAGE, INTERNET ACCESS! This is a top floor studio condo with high ceilings, western views and lots of light. Features a full kitchen with accessories and a gas fireplace. Quiet, relaxing and roomy. Enjoy Rimfires amenities that include a hot tub, sauna, fitness room, free WIFI, and heated garage.